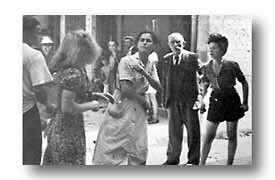 The French, an imaginative and vivacious race, seemed more sincere in their appreciation for having been liberated than had the Italians. All along the way they tossed flowers and fruit at passing jeeps. Many of them, English-speaking, repeated their gratitude over and over again (above). 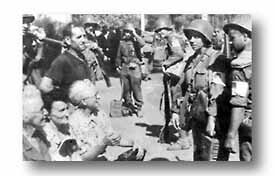 And now that the German occupation had ended, the French patriots would tolerate no one who had consorted with the Germans. (Below): A partisan and a Nazi sympathizer are about to slap it out. The blondes hair was clipped. 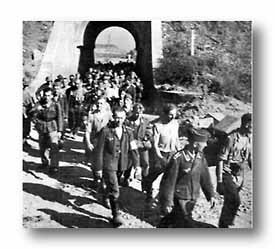 When the first batch of German prisoners were about-faced and returned to the beaches, the French ran out onto the roads to curse them for stealing their food. 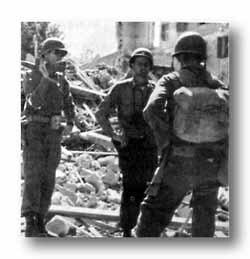 143rd Infantry officers confer on a patrol mission in the ruins of San Raphael. 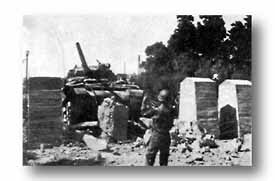 Having previously fired its gun at this San Raphael road block, a TD attempts to plow through the rubble it had not succeeded in downing.